Thank you Lord for another testimony of your grace and glory. In Christ, amen. He is blessing me with bibles for ministry much cheaper nowadays – Free! Blessed be the Lord. At any rate, around a year later, there are still a few cases left. I spoke to the Lord about them and desired giveaway opportunities. Last week, He answered, twice. Praise God. Out of the blue, I get an email (also last week) from a stranger in Arkansas: “Do you know where I can find some cheap bibles? 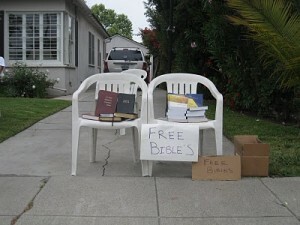 Our small local church is struggling and they need some bibles. I also want to get some out in ministry work.” haha. Praise God. Bible giveaway is in motion. Thank you Lord. (Wow, I originally thought the email was from a complete stranger, but it is from a fellow blogger, Tawana. I just now found that out, I thought all week it was a stranger. Wow, the Lord works in such cool ways).